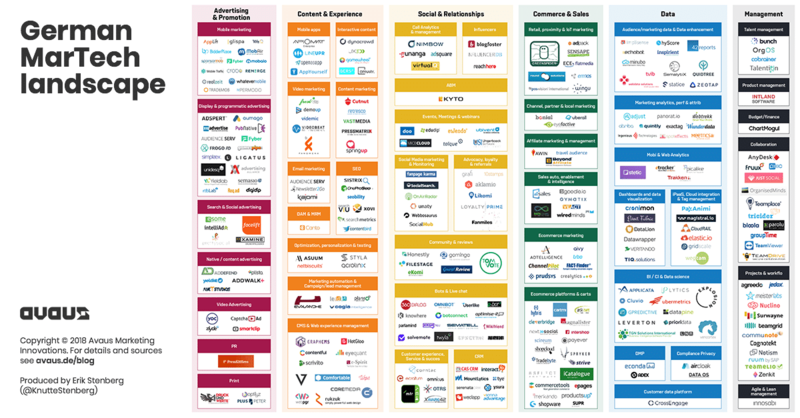 Scott Brinker, perhaps the most influential commentator of the ongoing technology revolution, annually publishes his famous Martech Martech 5000 – a heavily logged and commented map of marketing technology companies of different shapes and sizes and in 2018 already totalling 6,289 firms. We found a total of 296 German martech companies, out of which 88 have received external funding in the value of 700 million US Dollars. So the number of German MarTech companies represents 4% of Scott Brinker’s total list of vendors, but what we found very interesting is the fact that only 70 of the vendors we identified are in fact included in his list. This means, that over 220 companies were not listed, which brings us to the assumption that even Scott’s large map of so many companies operating in this field is likely quite a bit larger in reality. The analysis was done by a team from Avaus Marketing Innovations, the leading Nordic agency for data-driven marketing. As we have recently expanded to Germany with a physical office location in Munich and have been working with a wide array of the companies listed in the supergraphic of Scott’s, we were greatly interested in learning more about the German Martech landscape and its underlying market dynamics. My team has for some years followed the evolution and expansion of the landscape with great interest. Previously we have surveyed the Finnish Marketing Technology Landscape which also uncovered a big and previously largely uncharted landscape of Martech vendors. The results, strengthens the impression that we are still only getting a glimpse of the plethora of the German companies that are operating in this space. It also underlines how the German marketing technology landscape keeps expanding. The global supergraphic grew from 150 companies in 2011 to over 1000 in 2014. Conversely, 28% of the German companies (for which we have founding dates for: n=205) in our German landscape graphic were founded within the last three years, over 80% were founded in the last 10 years. So, the landscape is young and it’s growing. That said, there seems to be a dip over the past three years. In part this may be explained by incomplete data for the most recent years (2018 in particular). In addition to that though, the decline might be associated with the composition of the landscape when it comes to the youngest companies. That is to say, during the most recent years where we see a spike in growth, there is an overrepresentation of companies in the sector of social and relationships (since 2014 they stand for 32% of all companies). With the growth of social media penetration slowing in the west and the chatbot hype cooling off, the decline in companies founded might correlate with these market shifts. With this recent growth it should come as no surprise that a large proportion of the German companies are small growth companies or startups. Indeed, 79% of the companies have 50 or fewer employees and 32% have less than ten. And within this dataset it seems that age also broadly correlates with size, with the younger companies being smaller as measured by number of employees. When it comes to funding, our data shows rather moderate numbers. 88 of the 290 companies seem to have received funding amounting to an aggregate of 700 million euros to (800 million USD) date. The largest chunk of that sum has been invested in companies in the sector of Adtech and Promotion. This seems logical given that in the realm of digital marketing, advertising has acted as a spearhead and is one of the most mature of the categories. Numerically, most investments have, however, been directed to the Data category, but in smaller chunks. Another noteworthy aspect is the geographical concentration of the companies. Perhaps unsurprisingly, the largest group is settled in the startup city of Berlin. Berlin clearly is the place to go for startups and founders in this area and is one of the most dynamic cities in this aspect across Europe. The business centers Hamburg and Munich are identically represented with 34 companies respectively and we also see some good deal of MarTech companies in emerging Rhein-Ruhr area hosting the cities of Cologne and Düsseldorf, as well as in Karlsruhe, which is a Technology region and home to popular Technology institute KIT. But after them it is a very long tail of companies dispersed across the country. The fact that the landscape is as big as it is, globally as well as in Germany, is an important finding, but what might explain this fact? Silicon Valley’s breakneck expansion and status as the undisputed tech hub isn’t what it once was, as The Economist recently covered in a briefing on the valley. Other cities are rising both stateside as well as in Asia and Europe with especially Berlin as a noteworthy contender. The numbers reflect the nature of digital business. Market entry is comparatively easy (as Brinker points out). Specifically for Germany, there is a large enough local market to make it viable to create solutions aimed at the German market or more broadly the DACH area. This allows for local players to compete with their local presence and capability to address their customers face to face in German. There is also the matter of a large group of hidden champions in the so-called German Mittelstand which are slowly waking up to the pressure and potential in digitalising themselves. And indeed there is a huge potential to unlock, McKinsey estimates that Germany could add up to 2,4 extra percentage points of GDP growth to 2030 by leveraging new digital and automation technologies (see article). An important step in that lies in the digitalisation of sales and marketing which offers a comparatively easy gateway on the digitalisation journey. Then there is the ever present question of privacy. GDPR has turned everyone’s’ attention to the topic which is especially valued in Germany (see the European Union’s 2017 Eurobarometer on attitudes towards digitalisation). This has been cleverly leveraged by many of the companies in the German Martech landscape highlighting their and their servers’ location within Germany as a central value proposition. All of this leads us to expect continued developments of the German Martech scene in the future. As the leading player from the Nordics in this field, Avaus continues to pay close attention to where the market is going, and we would like you to be part of that as well! We have covered more on this topic adding the global MarTech perspective and actionable recommendations for marketers on how to act in this new world in our recent webinar held on 13th of December 2018. You can watch the recording of the webinar here. This is only our own approximation of the landscape and, a first version. As such it may contain some errors and might also to be fully complete. If you spot errors or missing companies, we welcome you to fill out this FORM and we will consider it in future iterations. This first version is a modest start relying on data from Crunchbase, and a few local German sources uncovered by good old desktop research, but for future versions we’re hoping to draw on additional data sources to provide a more multifaceted analysis.